CTPH Gorilla Conservation Camp in Buhoma to the north of Bwindi Impenetrable National Park the Uganda gorilla trekking safari haven undertakes a credible role of relating the people with the gorillas. The area surrounding Bwindi Impenetrable National Park is considerably highly populated with high poverty levels. The land is fragmented and the likelihood of encroaching on the virgin protected land of Bwindi is high which in turn pose a great threat to the continuity of mountain gorilla populations always explored on gorilla trekking safaris in Uganda. In the current set up, the issues like food competition and the zoonotic disease spread right from the gorillas to the humans and to the livestock all stand. Considering facts that Uganda is listed on the UN human development scale as 154 out of the 177 countries that are densely populated worldwide while at the same time hosting almost a half of the endangered mountain gorillas with a minimum of 400 known to be thriving in Bwindi alone, the need to strike a balance and ensure livelihood development and continuity of both is very vital. The mountain gorillas explored on gorilla safaris in Uganda feature 98.4% of their genetic content similar to that of humans and thus the human diseases can spread to the gorillas directly and yet gorillas have not gathered that immunity to neutralize these illnesses. 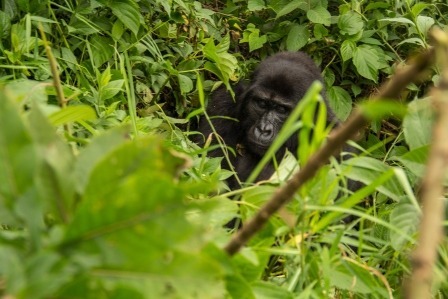 Diseases like Tuberculosis, the anthrax, diarrhea, the flu and measles along with flu are a threat to humans, livestock and wildlife including mountain gorillas. The CTPH group spearheaded by Dr. Gladys Kalema was inspired by the outbreak of scabies among the mountain gorillas in the year 2002. This nonprofit making organization focused on the interdependence among the humans and the wildlife health considering the fact that these two interact and the returns may affect both. The body implements the three strategic moves including the Human Public Health and Information, Wildlife Health Monitoring and Education & Communication. The approach of CTPH centers on prevention of transmission of Zoonotic diseases and also acknowledges the local community dependence on gorilla tourism thus realizing that the deterioration of gorilla health leads to deterioration of community life as well. In implementation of this initiative, the CTPH works with the Medical office of Kanungu District and the local health center to develop better health services of the communities in Bwindi. The Population Health and Environment approach is utilized to neutralize the threats to gorillas along with other wildlife through community based health care consolidation like family planning promotion, the TB prevention and control along with HIV/ AIDS, the dysentery and Scabies implemented through sensitization along with community volunteer health network. In the process to sustain such initiatives, the livelihood livestock projects have been initiated in the community and active community participation to own the initiative. The organization also operates a camp that offers basic accommodation to the Uganda gorilla safari tour undertakers visiting Buhoma and the profits are put to gorilla conservation.